Published in June 2014 by Shearsman Books: for more information. Reviewed by Ian Brinton on Tears in the Fence – “I urge you to get hold of this little thirty-page volume: you will return to it time and time again”: Read the full review here. Reviewed by Andrew McCulloch as one of the “this year’s best” chapbooks, submitted for the Michael Marks Poetry Pamphlet Award: At the heart of The Time We Turned [. . . ] is a sequence of sonnets for the nineteenth-century Galician poet Rosalia de Castro. Her vernacular language and love of place recall Wordsworth – she asks you to “sing in a language you speak . . . praise / her country from the lips of your springs” (‘For Rosalia’) and Crucefix joins her in a “lovely wavering uneasy conversation” (‘A thousand chattering images’) which often turns – hence the title – on recovered ‘spots of time’. This is a modest sublime but its clear, compelling outlines throw long and complex shadows. (The Times Literary Supplement (November 21, 2014)). Reviewed by Eileen Klein for Dundee University Review of the Arts: “glorious word landscapes . . . an impressive way to tell a story” – read full review here. 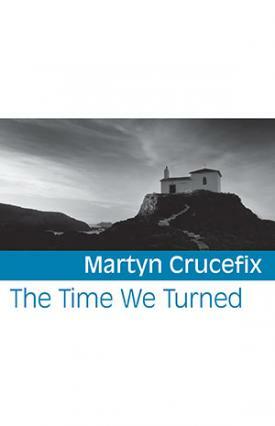 Martyn Crucefix’s new poems vividly evoke the landscapes of northern England and – in a sequence of sonnets inspired by the writing of Rosalia de Castro – the north west of Spain. But more than place, they explore the ways in which we inhabit time – how we are harmed and healed by it, how we deny, ignore, sublimate, repeat or reprise it.